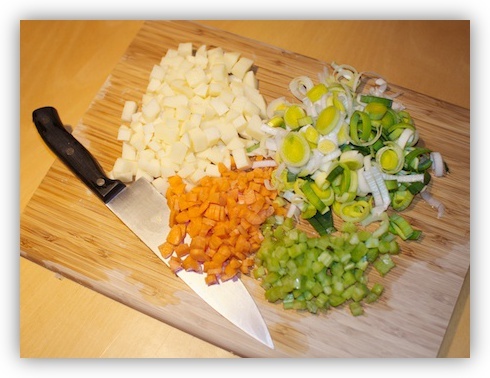 Because this soup will not be blended at the end, it is important to chop all the ingredients finely. 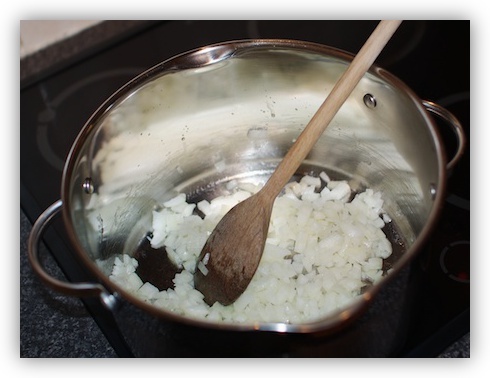 Start with the onions, and start them frying in some vegetable oil in the bottom of a large pot on a medium heat. While the onions are softening, chop the potatoes, carrots, celery sticks, and leek. I like to quarter the carrots lengthways before slicing them into thin slices. With the celery I also like to cut it into 3 or 4 strips lengthways before slicing. Also while the onions are softening, prepare the vegetable stock, and boil a kettle of water. 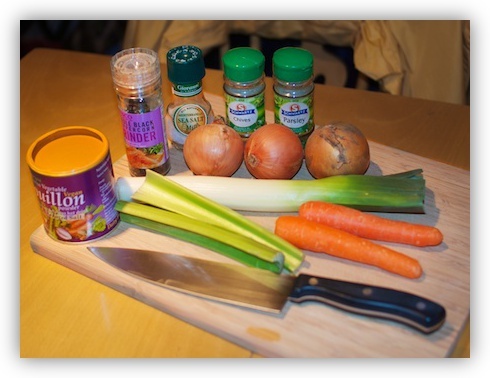 When the onions are soft, add the rest of the now chopped vegetables, the stock, and 1 litre of boiling water. Turn up the heat and bring the whole lot to the boil remembering to stir occasionally. 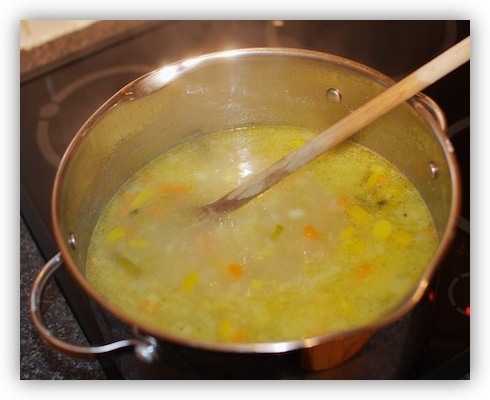 It will take at least 30 minutes of gentle boiling to cook the soup. When it’s ready, the vegetables should be thoroughly soft, and should melt in your mouth. Depending on how thick you like your soup, add some or all of the last litre of water at this stage, or even a little more if you want. When you’re happy with the consistency of the soup, then it’s time to season it. Add salt and black pepper to taste, as well as about two table spoons each of parsley and chives. Remember, you have between 3 and 4 litres of soup here, so it will take a lot of seasoning. 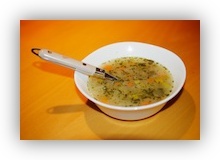 As I mentioned at the start, there are many variants of this soup. My grandmother always adds some of the smallest alphabet spaghetti I’ve ever seen, as well as some small marble-sized meatballs if she’s making the soup for a festive occasion. Some people add rice rather than spaghetti, and my mother likes to add some Tomato Puree to turn it into Tomato & Vegetable soup. Finally, you can also add a can of your favourite beans to make the soup more filling. Black eye beans look nice in the soup, but really, and bean should work. Bart, this sounds like a really delicious soup, and even better because you’re sharing your family’s favorites with us. Your descriptions and photos are getting better and better! There are a lot of spring vegetable soup recipes available online now — try Taste Of Beiruit dot com and search on spring veg soup for another variation shared with me by a friend of Al’s. Delish. Ohhhhh, My mother (Simone Cooreman)came from Flanders near Geraadsbergen and my grandmother always had this soup on her farmhouse stove. She put little stars in hers and meatballs sometimes. Then on hot days, we had bowls of sweetened buttermilk from the cellar. Rice pudding always and croquette potatoes if I was very good! What days! thank you…I shall make this! Hope you have fun with the recipe! I used this recipe last night. I am generally a lousy cook but following your directions I was able to make an awesome soup! I added both black beans and red beans though and didnt cook the vegatables down as much. I like them with a little more texture. Thank you for this recipe! Thanks for the feedback James – glad to hear you had a good experience with it! I just have to say a huge thank you for putting this recipe on the internet. I went to Belgium and visited family over there years ago and had my aunties version. Its true every Belgian mother has their own version of this soup. Anyway I have been trying to get the recipe off her ever since (only about 4 years). I found this recipe through a google search about 6 months ago and have probably been back here at least 10 times to remake it. Always have some stored in the freezer, I love it! How long does it take to ready things up? And how long does it take to cook? How much bowls can this fill? 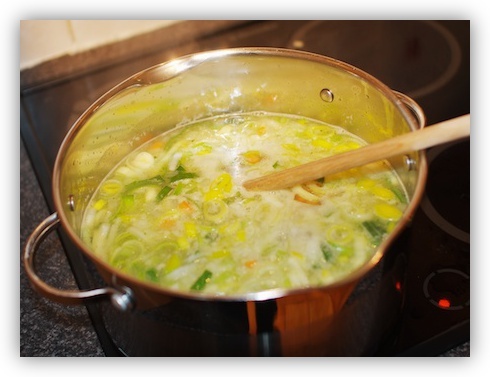 I really love Belgian soup and this looks like a great recipe for me to make in UK – there’s a more Green soup too – do you know what they use for that? 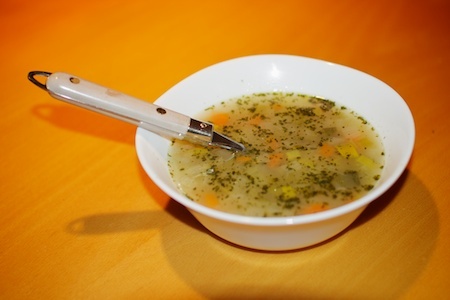 I added mushrooms to this great recipe….very good.